It may be hard to fathom that a 14-song, nearly 70-minute-long concept album might actually be considered “scaled down”, but North Carolina’s BETWEEN THE BURIED AND ME (or just BTBAM) really set the bar for grandiosity and sheer scale at a new high last time out with the two-part The Parallax: Hypersleep Dialogues/Future Sequence magnum opus – an EP and full-length prog/tech/death metal combo meal that clocked in at a staggering 100-plus minutes all together.So while BTBAM’s seventh full-length Coma Ecliptic may be more cinematic – and more genuinely “rock opera”-like with its narrative thread and theatrical flare – it is also more modest simply by default, which is a good thing after the often exhausting histrionics not only of the Parallax suite but the monumental The Great Misdirect before it. And that’s not to say the band’s progressive sense of adventure is any less, well, adventurous here, it’s just a bit less overwrought and over-indulgent — though, on the flip-side, it is rather jumbled. Coma Ecliptic, as the band’s press materials explain, tells the tale of a comatose man’s psychic journey through his past lives, with its ultimate lesson being that as you move through life, make sure to stop and smell the roses along the way. Or something along those lines. Each song tells the story of a different part his life — at least as his unconscious recalls it — in an arc that begins with the plaintive piano and vocals of “Node” and the more buoyant “Coma Machine” where the band sound something like a QUEEN/QUEENSRYCHE/PORCUPINE TREE hybrid. “Dim Ignition” takes a more electronic route and recalls RADIOHEAD. It isn’t until “Famine Wolf” that the bombastic, full-on tech-metal side of BTBAM really rears its head with its freewheeling stop-start spasmodics and mood swings — and jarring volume — and the roller-coaster ride of sounds and styles that is the guts of the album begins in earnest. The quiet/calamitous “King Redeem – Queen Serene” is equal parts delicate YES-like prog and tech-death turbulence, with its frenetic back half standing in marked contrast to its almost hypnotic front. “Turn On The Darkness” mixes and matches these same ingredients, but in a more Cuisinart-like fashion a la “Famine Wolf” – and with a splash of “Kashmir”-like symphonics and a jazzy guitar solo thrown in for good measure. The jaunty “The Ectopic Stroll” rides an almost disco-like drum beat as frontman Tommy Rogers channels Elton John with his piano riffs. Add the whimsical, Zappa-like electronic twiddling of its midsection, and it makes for the album’s quirkiest song — and one the most unique the band has ever done. “Rapid Calm” lathers on the electronics and keyboards and again hints of RADIOHEAD – as well as RUSH – with intermittent bursts of metallic muscle. At 9:55, “Memory Palace” is the album’s most expansive track and boasts a more pronounced DEEP PURPLE/ELP/PINK FLOYD ‘70s prog vibe with its organ-like strains, rollicking riffs and glorious harmonies sharing time with the band’s more typical crazy-quilt dynamics. It serves as something of a denouement here, as the album almost glides to a finish from there with the mostly middling hard rock of “Option Oblivion” and “Life In Velvet”, which circles back to the opening track’s Spartan piano and vocals before its brash, but brief crescendo. While the Parallax package may have been overblown in extremis, it bore the BTBAM sonic signature in no uncertain terms – something the band had carefully crafted over a dozen or so years. 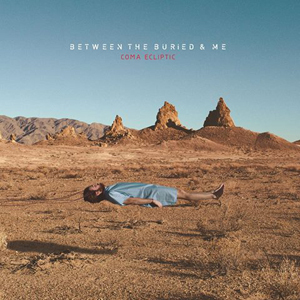 Coma Ecliptic, on the other hand, sees the band grasping for an identity, with the mish-mashy sound calling to mind a host of influences – as noted above – instead of being instantly and consistently recognized as BTBAM. The tech-metal the band has built its reputation around – and is very accomplished at - ends up earning a lesser share of the overall soundscape than the pop/rock opera elements, which is unfortunate, even if Rogers’ clean singing is quite magical. The album certainly aspires to a lot. But its delivery is confused and at times uncomfortable as the new elements of the band’s sound clash with the old. As a stepping-stone, Coma Ecliptic is an admirable and even commendable effort, but it can be a frustrating listen. To its credit, BTBAM has always been a band that was unafraid to put its aspirations first and let the execution catch up. And with the impressive chops Rogers, guitarists Paul Waggoner and Dustie Waring, bassist Dan Briggs and drummer Blake Richardson have proven time and again they have, it never takes long for the band to figure things out. So maybe next time. Order your copy of Coma Ecliptic in the KNAC.COM More Store right HERE.